Are you unhappy with rapidly increasing electricity rates and the general state of BC Hydro finances? Are you looking for the party responsible? Well, the Vancouver Sun has the answer. It’s a person named Clark, but not the one presently in the Premier’s office. “Under the New Democratic Party, BC Hydro has been viewed as little more than a cash cow for the government,” declared Opposition leader and soon-to-be premier Gordon Campbell on the eve of the 2001 election campaign. Shocking, isn’t it. Kudos to Vaughn Palmer for providing key facts. Turns out Hydro has paid $5.4 billion in dividends to the province since 1992, of which 60 per cent — or $3.2 billion — had to be borrowed. Presuming Hydro had been able to use that money to offset its own borrowing needs, the Crown corporation’s current debt ($15.4 billion and counting) would be that much smaller and the upward pressure on rates from interest payments would be reduced as well. However, that turns out to be a rewording of government press notes and it is not entirely accurate. Since 2001, BC Hydro payments to government total almost $10 billion and it does not take a graduate degree in finance to know, had that money not been paid out, the crown corporation’s borrowings would be reduced by the same amount. It is an illogical fiction to pretend that only $3.2 billion had to be borrowed to make payments to government during the past 23 years. 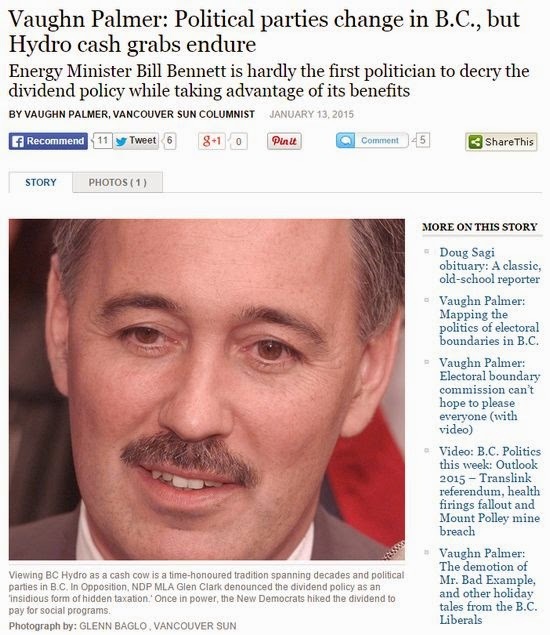 Mind you Palmer could also have reported that when Glen Clark became Premier, BC Hydro’s long-term debt was $7.496 billion and, when he left the office three years later, it was $7.474 billion. When Christy Clark became Premier, the utility’s debt was $11.712 billion. According to the September 2014 financial statements, the debt was $16.588 billion, not the lesser amount from ten months ago noted on the BC Liberal’s press notes. That’s a 42% increase in long-term debt of BC Hydro, but the amount is chump change compared to borrowings planned in the next few years and the over $50 billion increase in contractual commitments to private power producers, which were non-existent during the days of Glen Clark’s profligacy. Another illustration of the different approaches to debt and spending during different times follows. It should be noted that quarterly statements of BC Hydro in the current fiscal year show long-term debt rising at a monthly rate of $171.5 million. That is the fastest ever rate of growth in BC Hydro debt. Liberal policies aim to eliminate elements of a progressive tax system to impose the financial burden of government on lower and middle income citizens. Had BC Hydro been able to use the “dividends” and water rentals extracted from it by government, the utility could have eliminated the tier-1 residential rate for the first 1,350 kWh used over an average two-month billing period. Instead, residents are hit with increases well above the rate of inflation. This is reflected graphically but not show is the 28% rate increase announced in 2014. 9% took effect April 2014, which will cause another upward move when the numbers for fiscal year 2015 are added. Maybe I’ll suggest it to Vaughn if I see him entertaining Liberals at some corporate speaking engagement or encounter him resting in a quiet pasture. Report news while making news? Mr Palmer is all too predictable. I vote we retire the deadbeat press release spinner – his schtik is getting very tiresome if you are at all interested in reality. Hydro's debt needs to be honestly reported and brought under control. It will be much easier getting rid of Palmer than retiring Hydro's flood of debt and servicing the dam Run of River payouts. Palmer owes the truth and all British Columbians an apology for his fiction. 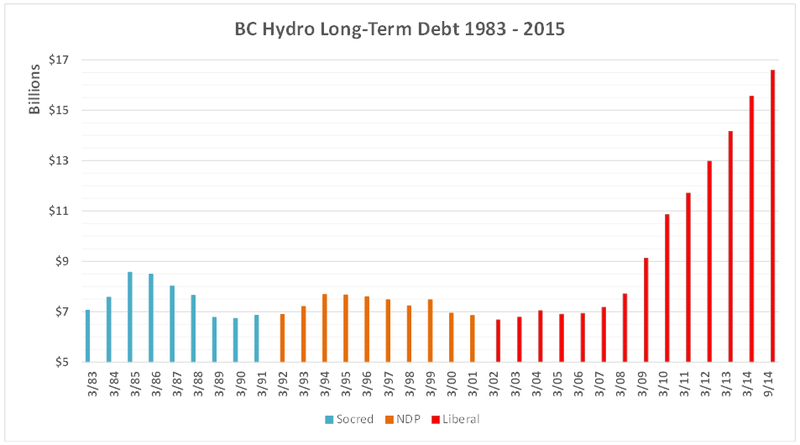 A lot of debt has been backing up as BC's promising future has spilled over our dam future. If we are interested in accounting truth we have the Auditor General and you Norm, certainly not Cowboy Bill Bennett – minister of stretching the truth and Spawn Palmer – stenographer of Liberal misdirection. Thanks Norm for presenting the facts and staying on top of our MSM. No wonder I stopped reading Vaughn Palmer years ago; he is so skewed to supporting the BC Liberals. Running a 15 year old picture of Glen Clark? pathetic. And his “analysis”? simply regurgitating government press releases. Sad. Conflicts of interest are as prevalent, it would seem, as they are perverse and pervasive. I assume that, if it were built, Site C would add at least $9 billion to that $18 billion debt on the graph, for a total of $27 billion. If we ever decide to stop using fossil fuel energy, BC Hydro will become an even more important asset, since it's about 95% clean renewable energy. Could it be that BCH is being drowned in debt in order to justify privatization? It's already 1/3 privatized. New power to a great extent has been privatized to IPPs. In October of 2011, BC’s Auditor General Doyle again raised the alarm about BC Hydro funneling billions of dollars in expenses into deferral accounts. “It is a bit like using a credit card: You have to pay it off or you have lots of problems,” he said at the time. Then Energy Minister Rich Coleman dismissed the concerns, saying he was confident BC Hydro would repay the expenses once projects like Site C were completed and were bringing in revenue. Current Energy Minister Bennett says he has only been alert to the problem since his first briefing on being appointed to cabinet following the 2013 election. Two issues jump out from these comments. First, it appears that the BC Liberals and “Mr. Fix It” Rich Coleman have planned and counted on Site C for years and the latest play-acting about tough decisions mouthed by Christy Clark are just another in a long line of deceits. Second, Mr. Bennett hasn’t been paying attention. Much like the comment above, Palmer & company are “predictable”. The other day I noticed the red head Baldrey write a comment on how the Lib's had quietly approved Taseko mine….. & he added “cue the environmentalist”. I thought what a sleaze bag. There was no professional reason to add that and it again paints the picture of a failed reporter who has a long time ago reached his peak in the business and is frustrated that he hasn't been offered a job in the Lib's multi-million dollar propaganda machine. I remember very well when a journalist always had sights on the bigger picture of the industry and reaching the top was a goal. If writing for Surrey Now is your goal then you are nothing more than a small time community writer. And yes I also agree with the above that people should ignore these individuals and let them quietly set off in the sunset with some Liberal connected PR firm. After all they do meet the qualifications. Just ask Stephen Smart. Thanks Norm for your hard work and insightful analyses. I read this in the paper yesterday and immediately thought that we are soon going to see the Liberals announcement that BC Hydro is in a financial mess and let's blame it on the fiscally irresponsible NDP – with the help of Palmer et al. Of course, we still won't see any reporting of the contractual obligations to the IPP's. On another note I heard an ad on the radio from a Hyundai dealership today. They were openly advertising that with the new Canadian – Korean free trade agrrement they were now going to be able to give car buyers a discount. My first thought was that is was how the Harperites and BC Libs will be able to help Petronas bring over those pre-assembled LNG plants from Korea and not have to maneuver through Canadian duties or taxes. Absolutely jarring isn't it? I wonder what has become of the media? They are agog at somebody wandering around naked at some park or are up in arms about Marc Emery being given the boot from the Federal Libs. These are really not issues. What you have brought up Norm is to the core of what should be covered. It actually grinds my teeth when I have to go to four or five different newspapers to get a pale image of what news should be. I listen to you, Alex tsakumis and Laila and Bob Mackin as often as I can. It really is the only way of being informed in this province. I actually hope that Palmer, Smythe and Baldry read this, but for them to get anything remotely approaching intestinal fortitude is too much to ask for. Thanks, K. Blake Newton. Distracting, dissembling, deflecting is a good description of what we're fed each day by media. I admit that Palmer is good at his job, which is to advance the issues of what we politely call “the establishment.” Most times, his work has to be carefully judged to detect the never absent bias. Probably a desk person doing page makeup chose the Glen Clark picture because Palmer is seldom so obvious. 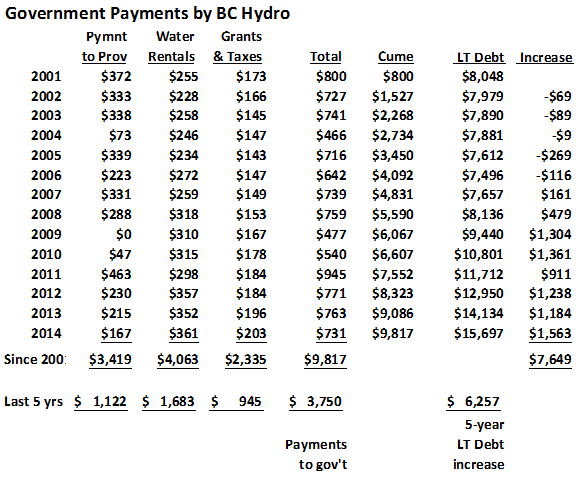 However, despite keeping my eye regularly on public issues, I was surprised at the BC Hydro debt numbers. What really surprises is that during the years they pushed new power production to the private sector ($55 billion owed on contracts), they were running up debt at unprecedented rates. The big change at Hydro seemed to occur in 2009. Maybe after winning the election that year, Liberals felt they had license to open the vaults and reward insiders and friends. In that year, they pushed out CEO Bob Elton because, apparently, the politicians saw him as someone who would not be helpful to their goals. Elton is now with VanCity and doing work at Royal Roads. Norm, any chance you could get him to comment publicly about BC Hydro? I agree it would be great to have Elton or another ex BC Hydro senior insider (David Cobb, for example) go on the public record and explain the massive change in BC Hydro. However, one thing those massive severance packages demand is complete silence so we're not likely to hear a word unless a new government establishes a Royal Commission to do a detailed examination of BC Hydro governance and investigate the looting of a once fine public utility. Hydroelectric power has a reputation for being a “clean” energy source that mitigates global warming. It does not release CO2, radioactivity or dioxins directly harmful to human health. It has also been noted that the dam would be built on a river that already supports two dams, rather than a wild, untouched stream. Some proponents also argue hydroelectricity is a relatively cheap energy option. A former chair of the B.C. Progress Board called Site C “our least expensive source of large-scale new power generation.” Cost estimates for building the dam have varied, with recent media reports providing cost estimates ranging from at least $2-to-$3.5 billion. Site C is our least expensive source of large-scale new power generation. The over-all cost of the project is $2.2 billion and can be 100-per-cent self-financed by pre-selling the power for export, resulting in little financial risk. There will be a positive return on the initial investment. …………………………. David Black was wrong, wrong, wrong on that one. No financial risk, eh? $2.2 billion in 2004 is $2.6 billion in 2014 dollars. In constant dollar terms, Site C is already budgeted at 325% more. Additionally, there is no way it can be self-financed when its power will cost more than its customers will pay. The BC Auditor General said the ancient fast ferry project failed partly because government had not prepared a “strategic business plan” before committing to the project. We've seen no business plan for Site C and it is a project 40 times larger by initial budget ($220M to $8,800M). Though I think you have a fairly tough hide Norm, you are indeed fortunate there is no flogging of disrespectful bloggers in BC. I suspect though, you are a frequent topic of discussion in the wine cellars and golf courses of Victoria. If it ever occurs that you start to take any heat, hopefully those of us who rely on you will come to your aide. On the other hand, why should the crowd who refuses to shoot straight worry? They will continue to spew the party line and be rewarded handsomely for it, knowing the numbers that read bloggers are insignificant…at the moment. Little has been said by anyone, other than Bob Mackin, about the transformation of Bill Tielman. That he is so in our faces about it is confirmation that what you write in this piece is true. They are pigs at the trough and don’t care what we say. Perhaps I misread Tielman in the past, what with BC Rail and some other decent work he did but I do find his turncoat actions disturbing. Does everyone really have a price? I can almost hear the whoop, whoop, belly bashing of the ever growing club of insiders. You left out the best part. The BC Liberals have vowed to eliminate this borrowing by BC Hydro to fund government dividends….IN 2018!!! Could it be?…coincidence that every public enterprise hen under the BC Liberal fox's watch turns into a fiscal basket case? Is there an exception to the rule that the self-proclaimed “masters of fiscal management” are actually fiscal charlatans? Don't forget the BC Office of Civil Forfeiture. Indeed BC Hydro's debt will long outlast Palmer—and if it's anything like BC Rail's “lease” (a couple-three orders of magnitude with a nine in front of it, as I recall), it'll outlast the Vancouver Sun too! The good news is that climate change may doom us all before Christy et al finally bankrupts us. Well, he didn't get much of that right did he. No wonder they fired him! Betcha there's no-one around that would dare make that kind of forecast now simply because it would hurt too many 'friends'. I believe Cobb is a principled man who could reveal much about political interference at BC Hydro… if he was free to talk. I hear that he was unwilling to do things he knew to be wrong and it was either that or resign. Since business executives have a duty to preserve confidences, we will only learn the truth about BC Hydro operations by appointing a commissioner who can compel witnesses to testify. Let's just hope there are more conversations about issues these days. If ordinary people don't push back, the elites will grow ever greedier. I saw statistics that show 1% of the world's population owns more than 50% of the assets. Those people are not saying that is enough, they want even more. Of course, they've got the resources to enforce those wishes and, if that means they have to buy control of media, or governments, they'll spend the money because the payback is handsome. There used to be the pretense that economic growth was intended to raise the standards of living for everyone but, there is no rising tide to lift all boats. The elites just buy taller boats. Years ago, someone described to me how business with government was done in Canada's maritime provinces. It was like a game involving two sides: the ins and the outs. Every few years, they would switch. The outs became the ins and the former ins became the new outs. Money flows to the ins so when a supplier of services was newly assigned to the outs, they'd have to wait patiently until good times returned, when roles were reversed again. This was not simply applied to lawyers, engineers, consultants etc; it involved hardware suppliers, plumbers, delivery services, cleaning companies etc. In the two western-most provinces today, there is no orderly rotation of government spending. It's the friends of Tweedledum and Tweedledee who buy BMWs; others ride the buses, or do honest work. I've said before that Bill Tieleman is a person who sells communication services. You can dispute what he says but don't be angry that he's doing his job. The equivalent would be anger directed at the advertising agency that creates commercials for a product you dislike. Focus on the issues, not the people. Unless, you're talking about Clark, Coleman and de Jong. On surface it's hard to believe BC voters are still as fascinated by the unwarranted smearing of Glen Clark a decade-and-a-half ago, back then a sideshow to a bedazzling 25% income tax cut, as they've been catatonic to BC Liberal sabotage of BC Hydro which has to be one of the most egregious breaches of public trust ever. 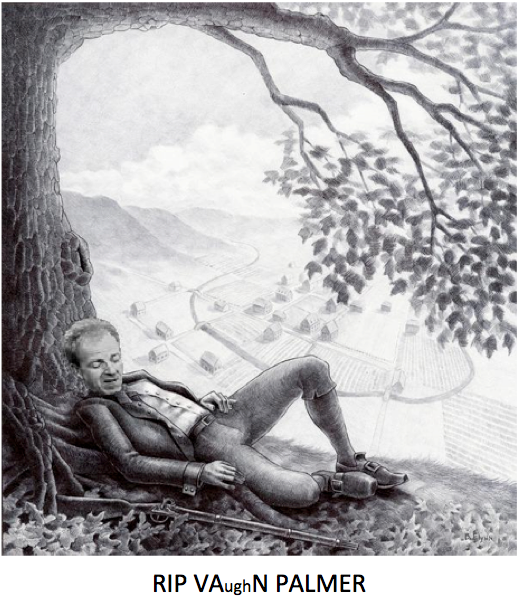 Gordo's true legacy will evermore be overshadowed by his eventual political disgrace, but, looking back, the circumstances that chilled his fervour to privatize our venerable public electricity producer whole-hog like he did BC Rail were cleverly accommodated, and would have to be acknowledged, with ethical qualification, as a perverse tribute to his inate intelligence: initially an agenda disappointment, and still representing an ostensible neo-right ideal unfulfilled —turning public enterprises over to profiteers and smashing public-sector labour unions—, it has become a fount of high crony culture that not only pays dividends directly, but does so for spinoffs like dams, mines, natural gas and, who knows?—maybe even pipelines too, like a giant, byzantine brokerage for BC Liberal insiders. Isn't it ironic that the neo-right crony-cultured BC Hydro might be too yummy to actually privatize like BC Rail, or cripple like BC Ferries? It can accommodate profiteering IPPs and remain publicly owned too! 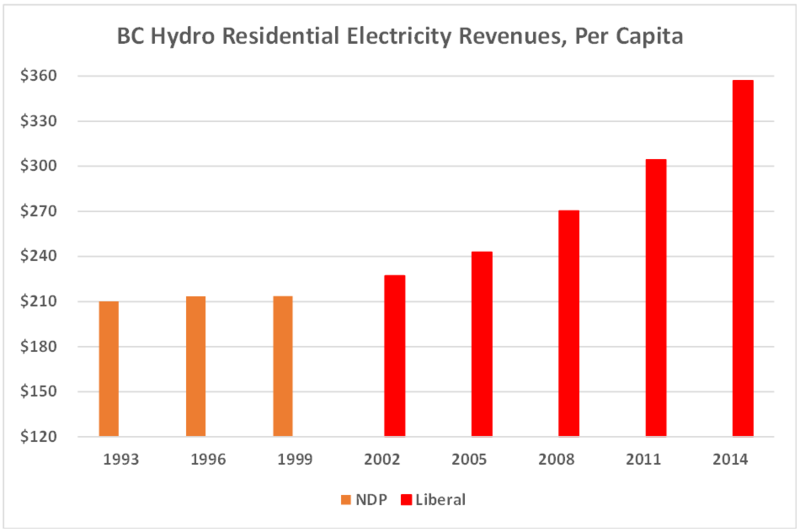 And with the BC Liberals' legislation forcing BC Hydro to buy their buddies' expensive power, it's profitable indeed! And, in addition to parasitizing the public weal, it can also reach directly into the pockets of Hydro customers right across the province! Sweet! But wait…while cronies tarry at the honey pot, mightn't they have overlooked another neo-right agenda item?…the one that's supposed to make their sabotage irreversible? We'll have to wait for an inquiry into every aspect of BC Hydro under the BC Liberals, the environmental, fiscal, economic, social and ethical to find out—which means a different government—which means a party that will commit to it—and to winning at the ballot box. Another mainstream media waste of time. The fix put in by the “BC liebrals”' relies on obfiscation and manipulation of the media, not only for BC Hydro, but BC LNG and a host of so called government managed entities. We live in a fools paradise, manipulated by a government that believes that citizens are too busy or don't care what they do. It considers the mainstream media, as a propaganda machine, and a cheer leading squad for their so called “message”. Enquiries? I can think of at least 5 that should be pubic and judicial in scope, to deal with the past 15 years of BC liberal stupidity, or what they refer to as governance.